Please use Windows 2008/2012 R2 Enterprise Edition 64 bit if you plan to use Windows Server OS as CCBoot server system platform. 1) All hard disks should be formatted as NTFS. When format drives, please set "Allocation unit size" as"Default" for server OS system drive, and set "Allocation unit size"as "32K" for other drives. 2) Allocate hard disks for image, game (raid 0) and write back (2-3 hard disks). If you have an SSD disk, please format it to only one partition for cache. How to allocation hard disks? Please refer to Server Hardware Requirements. 3) Make sure that there is no other DHCP services on the LAN. Especially, please disable the DHCP service in the router. How to do "Enable write caching on the device" on disk? 1) Click Start, right-click Computer and select Manage. 2) In the left panel, click Device Manager. 3) Expand Disk Drives and right-click on one of the disks. 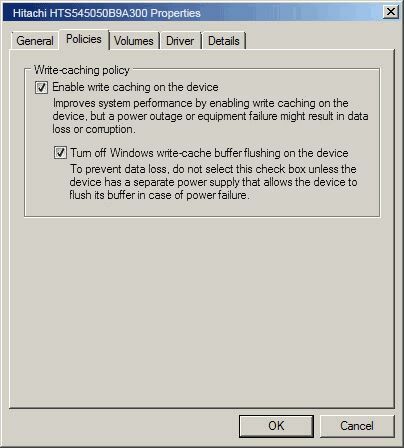 5) To further improve the disk performance (needless to say, higher the risk now), check the box "Turn off Windows write-cache buffer flushing on the device". 6) Press "OK" to save (Figure 1-1). 7) Implement step 3 - 6 for other disks.